Warning: Jon Snow-related spoilers below, so proceed with caution! At the very least, I can say that the Game of Thrones season eight premiere contains no shortage of surprises. In addition to Euron and Cersei getting busy (after mourning the absence of those freakin' elephants), Jaime having an awkward run-in with Bran, and other long-awaited reunions, the first episode of the eighth season includes lovebirds Jon Snow and Daenerys Targaryen taking a goofy dragon ride through the Northern countryside. The moment, though filled with cheesy dialogue and allusions to Aladdin's "A Whole New World" scene, is also a fairly important one: someone other than Dany is able to ride a dragon, y'all! Suddenly the Three Heads of the Dragon prophecy is seeming more important (and confusing) than ever. 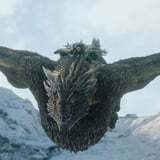 Jon's ability to tame and ride Daenerys's green-tinged dragon, Rhaegal, isn't necessarily a surprise - he essentially cuddles with Drogon back in the season seven episode "Eastwatch," and now we know that he indeed has Targaryen blood running through his veins. In fact, Jon's real father, Rhaegar Targaryen, makes his dragon ride all the more significant. All three of Dany's dragons are named after someone important to her. Her favorite, Drogon, is the namesake of her late husband, Khal Drogo, while Viserion (who's now under the Night King's control) is a nod to her dead, abusive brother, Viserys. As for Rhaegal, the dragon is named after Rhaegar, Daenerys's eldest brother and Jon's biological dad, who died before the events of the show. Since Jon takes the dragon for a spin at the start of the episode, he has no idea that Rhaegal is actually the namesake of his real father. He doesn't find out the truth until the end of the premiere, when Samwell Tarly finally explains the truth of his lineage in the Winterfell crypt. It'll be interesting to see what Jon does with the news that Rhaegar is his father, which means that he therefore has a legitimate claim to the Iron Throne, and also his new boo is his, um, aunt. (Kind of a mood killer, you know?) Hopefully Jon and Dany will find a way to unite the Targaryens and the Starks in the way that Lyanna and Rhaegar never got a chance to.